Lady Lisa Bear | Family, friends, and baking. Oh, and …. Lady Lisa Bear Family, friends, and baking. Oh, and …. …another blogger requested to see some of the Christmas Cards that I have drawn over the past 26 years. This is the best place to post them. When I was about 16, my Mom asked me to draw her card (I can confirm the year once I get the folder of the rest of the cards out). We’ve incorporated Dad’s position as GM of the World Trade Center, my going to college in DC, various vacations, hobbies, family celebrations, etc, into the designs. And about 8 years ago I began to draw my family’s cards, too. One Aunt has all of them taped to her closet wall. A cousin puts them all out every year with the current year’s cards. They aren’t fancy. I’m not the best artist. But they are personal and different. Here are some of the last few years. Once I get up into the attic I’ll dig out the file of the rest of them and scan some of the more interesting ones in and post those, too. You can click on the images to see bigger ones. The small boy is The Cub. The cats are Ceilidh and Dara. The ornaments are things we do or like or play with. The Cub again. Ornaments are some of the things we like. The Cub and Mickey the year of our trip to WDW. We went to DC last year, hence the Monument and various DC characters. The bikes are because The Cub learned to ride without training wheels. The small thing on the side of the Monument is an ant carrying an ornament. The leaf cutter ants were one of The Cub’s favorite critters in the Natural History museum. The rolling pin and pot on the flag behind the plane are because we saw Julia Child’s kitchen in the American History museum. This is one of my Mom’s cards, the year that they took a Baltic Cruise and drove across the US for a wedding. The garland is a list of the cities that they visited in Europe and the balls are the states that they drove through. The car is for The Cub, the doll for his cousin, and the little box for the second cousin who was about 3 months from being born. We have reached the summer halfway point. Specifically, today is the second day of the second half of The Cub’s summer break. I lost track of blogging. So here is an update. The Cub finished Kindergarten with a very good report card. The only issue noted was that he had started to act sillier as the year came to a close. But his reading is now at an L/M level, which is beginning 3rd grade level. Oof. We bought two summer workbooks for him, one a 1st grade prep and one a 2nd grade prep. We aren’t pushing him to work in them, or drilling him on anything, just trying to work pages into a couple of days a week and to continue to work math and reading into everyday life. He’s almost done with the 1st grade prep one, so we should be working on the 2nd grade prep on for most of August. And he’ll sit down with the book without us asking him too, at times, as something to do. We relocated the one bookshelf and he’s made that little nook into a reading spot. He spent the first full week of his summer break in NC at Camp NanaPa. They ended their 4 week tour of the upper midwest at our house on the 2nd to last day of school. We had some family gatherings that week-end, including my youngest cousin’s HS graduation party. Then they packed up and headed for NC on Monday. I miss him when he is gone, but it is good for him and for us. While The Cub was in NC M’Lord and I worked for most of the week. 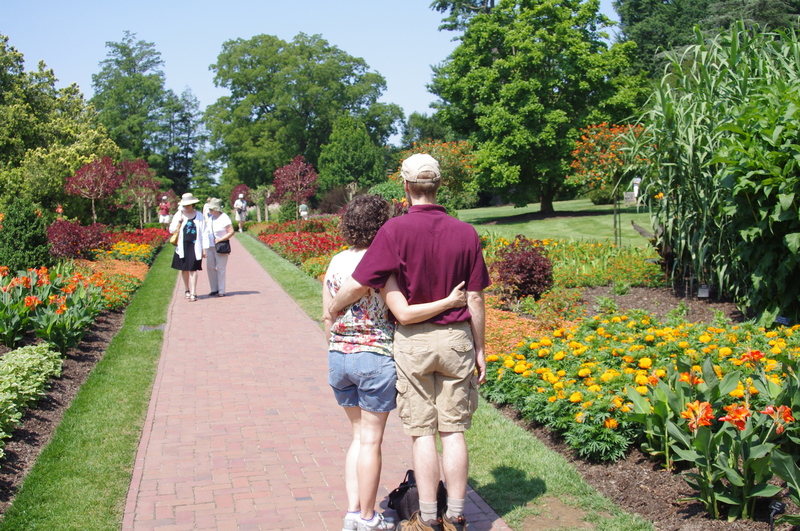 But we finally took a trip out to Longwood Gardens. I’ve wanted to go their for many years, but didn’t think that The Cub would enjoy it, especially now that I have my good camera and was stopping to take multiple shots of the same flower with different settings. He’d like the Children’s Garden and the treehouses. We had a lovely, though hot, day wandering the gardens and the Conservatory. I’d love to go back for the Christmas trees. We also attended the local wedding reception of a wonderful friend who was married in FL in March. On my niece’s birthday. Easy to remember. It was held at the NY Botanical Gardens. The camera came to that venue, too. We arrived about 1 hour early as we were concerned about rush hour traffic on a Friday evening. So I took some time to wander and photograph the flowers, call The Cub to say goodnight, and talk with friends who had also arrived early for the same reason. The food, friends, music, and dancing were wonderful and I got to dance with the Groom. He’s a competitive West Coast Swing dancer and also an well known DJ for dance competition week-ends. So getting to do a WCS with him was an honor. The following Monday, my Aunt and I drove down into VA to meet up with my parents and my mom’s cousin for lunch and to pick up the Cub from them. I had my boy back. 4th of July was quiet. We had s’mores and sparklers in the back yard with friends. The Cub had Space, Infinity and Beyond science camp in the mornings for the next week. He came home with all sorts of flying things, including a rocket. He also began his weekly swim lesson. 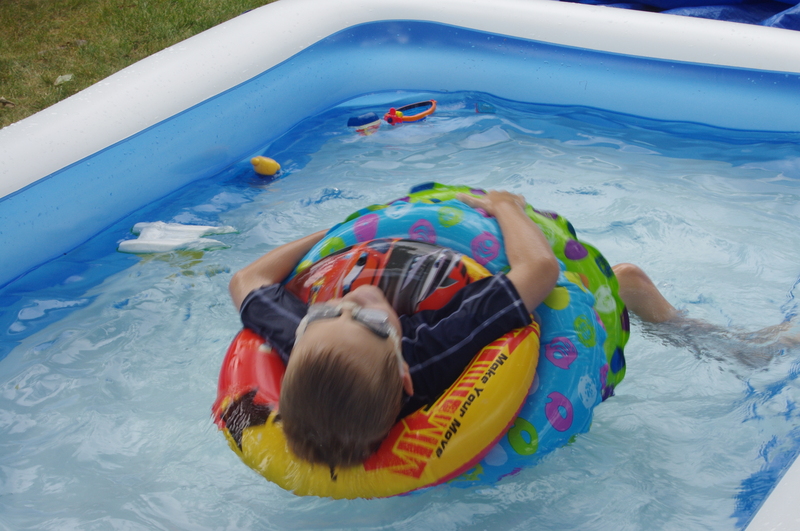 The last two weeks have been some swimming at the local pool or a friend’s local pool, splashing in his own little pool in the back yard, trips to the library, lots of reading, some bike rides with his Dad, game playing, playing in general, and surviving the heat. I am not a summer person. So, while wishing time away is a waste of time, I am ready for October weather and clothing and baking. 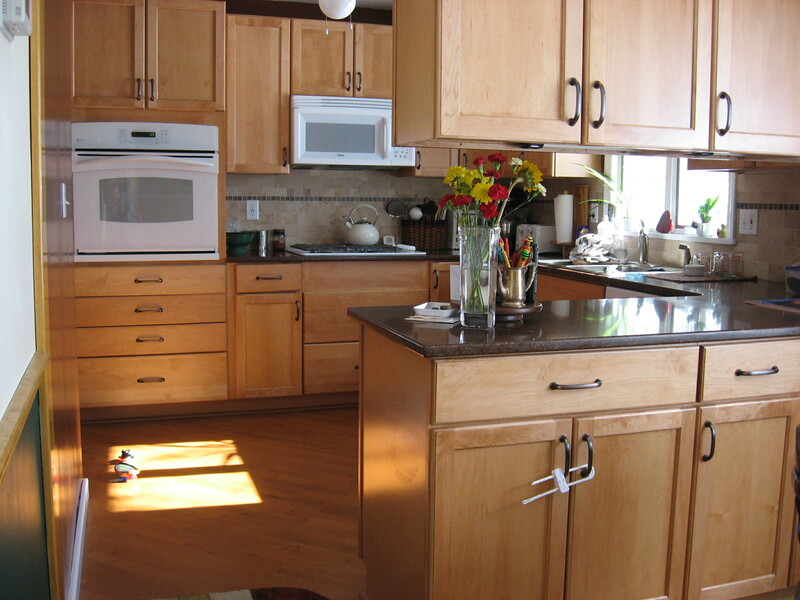 We renovated our kitchen 5 years ago. 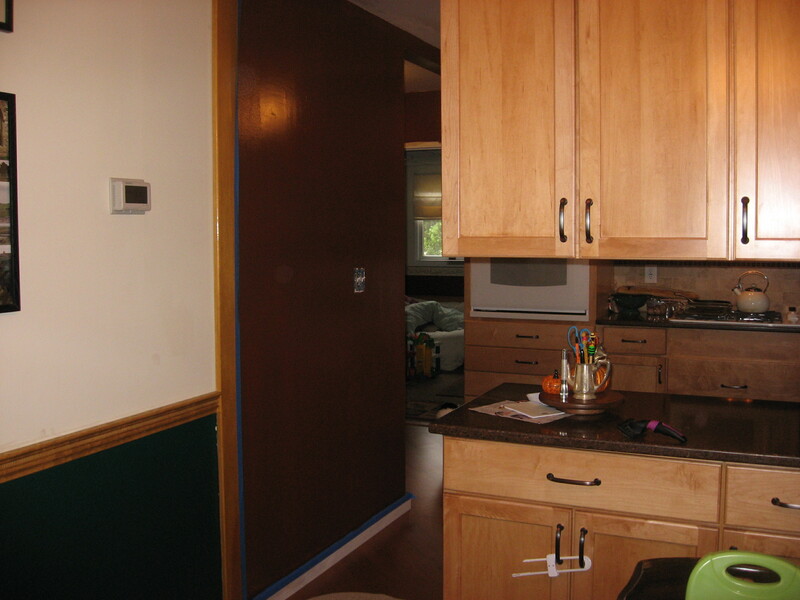 Once finished (though I still need to level some of the cabinet doors) we painted the room brown. It picks up the colors in the Silestone “Mahogany” countertop and the glass accent tiles in the backspash. The official paint color is Wine Barrel, which is fitting in this house, too. There was one blank wall. We thought about what to put on that wall. Hang the cast iron skillets? A collage? Then I found the site WallWords.com. I thought about ordering it. Then M’Lord and I agreed that I could paint it myself. We chose a font and a size and printed out a sample. I used a long level to give myself guidelines. Then I painted the saying on the wall. 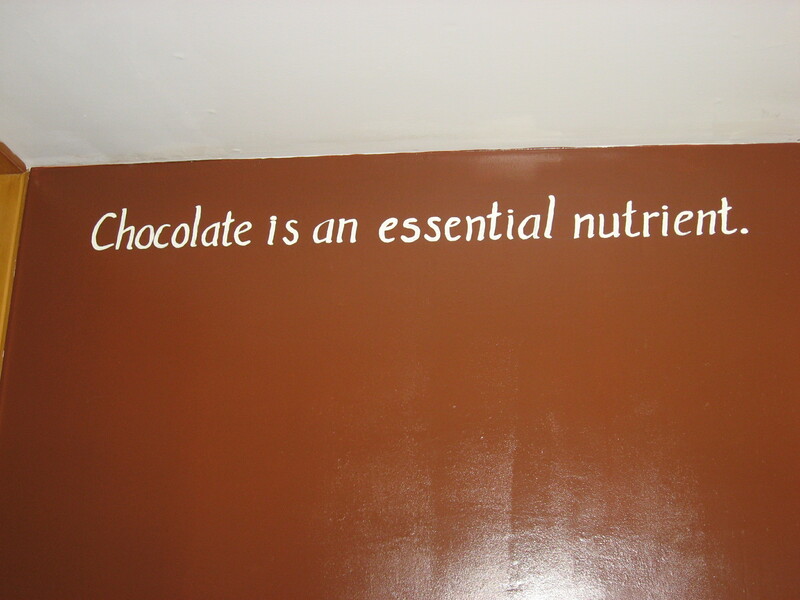 The rather chocolate colored wall. My arms and shoulders and neck were rather sore from the reaching and craning, but it came out well. It is a hit whenever someone new comes over and sees it for the first time. While commenting on InsideNanaBreadsHead’s blog I mentioned it. I’m still trying to decide on something to paint over the window over the sink or over the chalkboard on the wall by the fridge. There is more on that wall now, but that is for another blog post. When we moved into our house it had been empty for two years. The yard was a mess and overgrown with ivy all around the house. I spent the first summer pulling out ivy. I”m still trying to keep it from taking over in certain areas. The creeping myrtle is trying to take over, too. There is forsythia in several locations. I’ve spent a lot of time pruning that back or removing it altogether. I love the tall lilac bushes along the back fence. 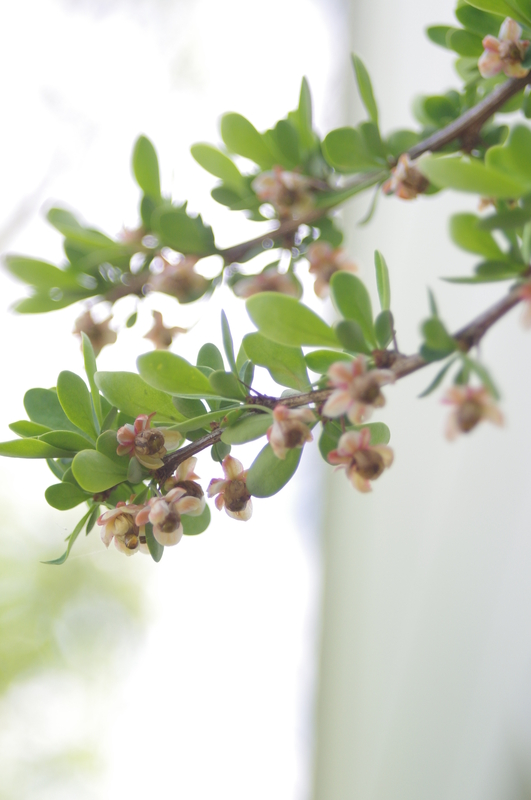 The smell sets off my allergies, so I don’t bring the blooms into the house, but they are lovely and the bushes (trees?) hide some of the rear neighbor’s white fence. I’d rather be fenced in with green stuff. The oddest thing was along the bedroom side of the house. Just a couple of feet in from the property line the old owner had installed 5 segments of stockade fencing. It doesn’t connect to anything at either end. The best that we could figure out was that it was to block the view to the bedroom windows from the neighbor’s family room. There was a sad rose bush right about a mid length. Between it and the neighbor’s chain link fence were privet or boxwood hedges. Many of these were dying. The sections were doing a really good job of trying to rot in the dirt as they hadn’t been installed up enough to prevent rot. So we eventually pulled the sections down, leaving the posts which are in decent shape. 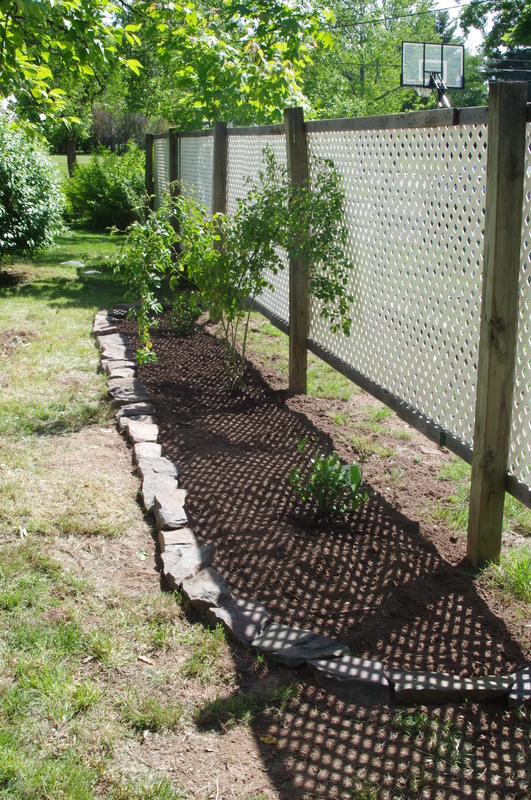 The stockade fence has since been replaced with lengths of vinyl lattice supported by lengths of 1 x 3 that were salvaged from other odd projects that came with the house. What we did do was install them from the tops of the posts, leaving a 1 foot gap at the bottom. Grass and weeds filled in where the boxwoods had been. I’m working on eliminating the weeds and establishing more grass. We finally attacked our side of the lattice area and did something that we had wanted to do for a while. There is now a garden edged with stones salvaged from a raised bed that we are eliminating. 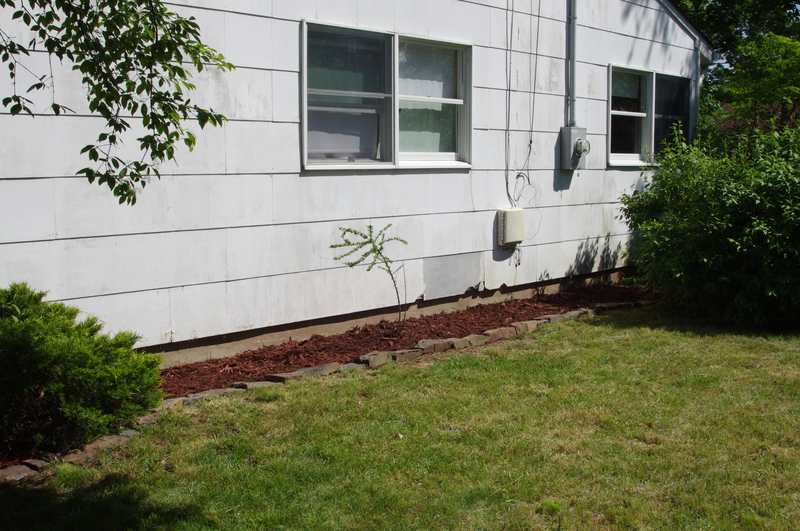 We’ve planted two blue berry bushes and transplanted a rose bush from another area that is about to be torn up. We are hoping that it takes to the transplant. If not we’ll get a climbing rose for that location. 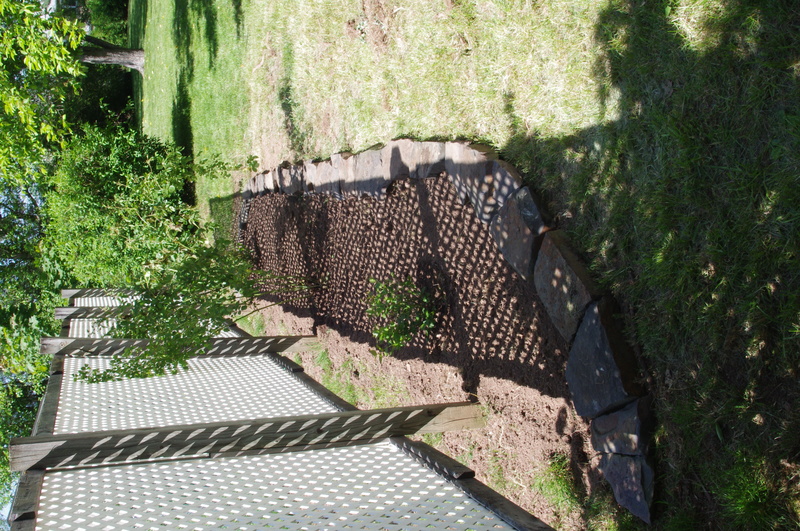 We need a few more plants for the garden area, but the tilling and edging and prepwork have been done. More stone edges a newly mulched area along the side of the house in order to make mowing easier, protect the poor remaining part of the thorn bush, and protect the grounding wires and siding (yes, I know it needs a paint job) from the weed whacker and lawn mower. The stone gives it a more finished look. I am hoping that the thorn bush fills back in. It was huge and died a rather ugly death, except for that one stem. That stem even had flowers this spring. The side yard looks much more finished now. M’Lord plans to build an arbor archway at the narrow area between the lattice and the forsythia. It’s a slow process, but the yard is shaping up. Now the “Patio” is a whole other story. I don’t remember learning to ride a bike. I don’t remember my first bike. I remember the pink one with the banana seat. I remember the big old blue bike with twin baskets on the back. It was a single gear bike. But it got me around town and to school. In grammar school I began to save up my birthday and Christmas money. When I had enough my Dad and I went to the local Bike Shop and ordered my first new bike. It was a red ten speed. A boy’s ten speed. My Dad preferred the strength of the boys frame. So I learned to start by putting my one foot in the pedal toe clip, pushing off, and swinging my other leg over the back of the bike. Once I grew too tall for that bike, I bought a blue ten speed. Boys frame again. I rode all over the local area. I rode to work at the day camp that I worked at during the summers. I rode in all seasons. My Dad belonged to a bicycle touring club and I would sometimes go on lower level rides with the group. We even did a couple of bike camping trips with the Club. Then I went away to college and worked full time during the summers. My blue bike sat in the garage. Finally, Dad asked if he could donate it to a group that refurbishes bikes for kids who can’t afford them. We donated my bike. 7 years ago M’Lord and I bought our house in a great area for local biking, including being near a canal with a walking/biking path where the old tow path was. So we bought bikes. This time I actually bought a girls frame. My silver Cannondale is a 15 speed hybrid that I can ride on or off road. No typical ten speed curved handle bars and skinny seat. It has shock absorbers and wide tires. I rode around locally. But I was out of shape and then got pregnant. The bike sat in the shed for most of the last 6 years. I’d go out for a short ride every once in a while. But the bike mostly sat in the shed. M’Lord, on the other hand, uses his much more often than I have, including riding 17 miles each way to and from work at times. This year I started to mix running with my walking, at the suggestion of my OB, to get my heart more fit. I asked M’Lord what it would take to get my bike back into working order. He thought that I’d need new tires, new cables, and some other work. However…when I got home from grocery shopping this morning I found him out back with my bike upside down. He’d checked and refilled the tires and given it a basic tune up. We fixed the seat height as I rode around the yard a few times. It seems to be fine. So after lunch I put on my bike shorts and took a 3.6 mile ride around the neighborhood. My knees were not happy about the ride, which means the seat needs adjustment, but I did alright. I just have to remember which ways the hand grips turn to shift up and down again. Half of my shifts were in the wrong direction, which is not fun while trying to go uphill after years of not using my legs that way. While my legs will be sore tomorrow. I got out on the bike and can now mix my cardio workouts between running/walking and biking. Either way, my legs will not be happy with me for a while. …the ability to get both the Cub and myself out of the house on time in the morning. For 3 1/2 years, two mornings a week, The Cub and I would get up at 6:30 am and cuddle on the couch while he watched Disney or Nick Jr. At 6:50 I would get up, get dressed, pack my lunch, get him dressed, feed him breakfast, and get us both out of the door by 7:23. I’d drop The Cub off at the sitter’s house and be on my way to work by 7:30. As M’Lord can go into work later in the morning, now that The Cub began kindergarten, M’Lord drops him off at school on those two mornings a week and then heads in to work. Today through Thursday M’Lord is in FL on a business trip. So, for the first time since August, I had to get both myself and The Cub up, dressed, and packed and out the door by 7:25. We didn’t make it. We left at 7:31. I dropped him off at a friend’s house, so that she would walk him to school with her kindergartener, and was finally on the way to work at 7:36, about 10 minutes later than I usually leave for work on my own now. Time of arrival at work…8:15, about 10 minutes later than usual. Maybe I’ll get my timing back on Thursday? The Cub is six. He’s been six since February 20th. I’ve tried to remember to write about how and what The Cub is doing a few times a year. During the first two years I would right letters to him. There were also the two years of calendars that you can set the months and dates from the child’s birth and make little notes about milestones. Then I moved to typing posts about 4 times a year. Then it sort of moved to twice. Now I’m trying to do it at his birthday. You can see how well I’ve done this year. Though, I will say, I was waiting until after his Parent Teacher conference so that I could include that information. So…physically he is healthy, energetic, blue eyed and blonde. At his well visit he weighed 48 lbs and was 47 inches tall. A pound an inch. 75th percentile height and 50th weight. Tall and slender, like his daddy and uncles. Sight and hearing are great. 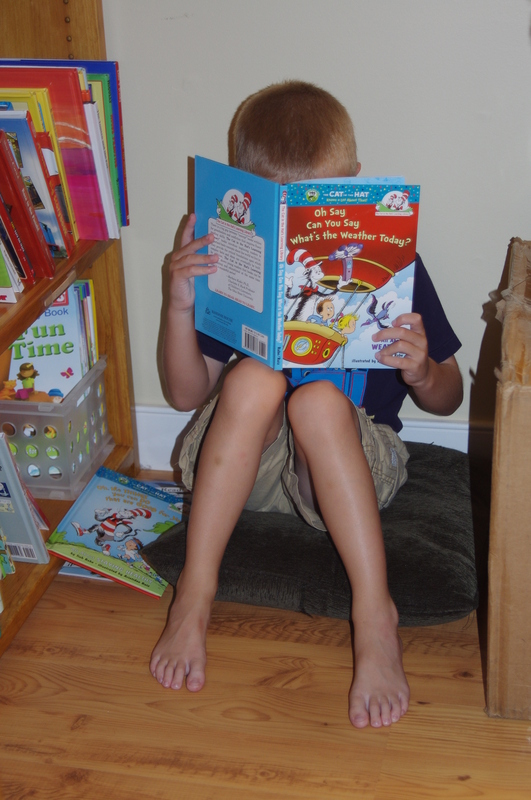 As for school…he’s reading at almost a 3rd grade level. He’s in kindergarten. His teacher is working with him on comprehension and has him help other kids in his class work on sight words. “This is my easiest meeting” is a direct quote from his teacher. We were trying to figure out which piece of artwork might be his and she suggested that we look for the neatest printing and best spelling. I was happy to hear that they really take time to figure out which teacher in the next grade will be best for each child. His teacher said that she is going to work on placing him with a teacher that will challenge him. The Cub is also the one student from her class that she would expect to test into 2nd grade math next year. She also said that, depending on how many advanced readers there are that they might make a small group of them that move between the teachers together to work on more advanced books. So we’ll see what happens in the fall. “He’s a bright kid. And he’ll always be that way.” And he gets along with his classmates and has friends that he regularly plays with on the playground. And at home…he loves to play with Legos and Cars and cars and still likes to play with his Thomas trains. The Cub loves to climb on his Daddy. He’s still a hugger and can cry easily when tired. He’s a mostly good kid. But he’s six, which means that he doesn’t remember to watch what he might knock over when he’s running or bouncing. Legos. There are Legos all over the house. The Cub is really creative with his random parts and pieces. He loves to build vehicles that come from shows that he watches or books that he reads. But he’s also really good with sets. We can give him a set and the only thing that he’ll need help with is putting on the stickers. Or finding a piece that might have rolled off. He follows the directions on his own. Computer and video games…because he can read he doesn’t need help with directions. He’ll find a new game and figure it out without much help at all. Right now he’s really into the Lego site games like Builder’s Island. And he can drive his own car on Mario Kart now. I used to steer and he’d fire the stuff and control the gas. Now he plays on his own. This week the school district held an art show. Two of The Cub’s pieces were on display. We are going to frame the penguins and I’ll “pot” the self portrait “Flower”. He’s getting more adventurous with eating, which is good, trying more different foods and declaring that he likes them. Like his mommy, he’s not big on raw tomatoes. But, like his Daddy, he’s decided that he likes salmon. Emotionally he is still a bit of a cryer, but not as much as in the past years. He’s getting better at using his words to tell another kid that he doesn’t want to play something or doesn’t like being hit or tackled, or whatever it is at the time. Progress. He’s doing just fine and I’m glad that he’s mine.